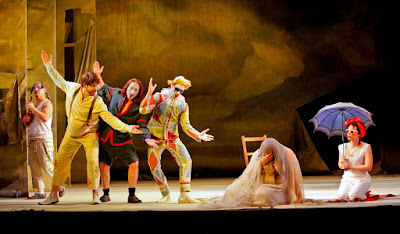 Tragedy meets comedy in Ariadne auf Naxos. Photos by Jeffrey Dunn. I wasn't surprised that Boston Lyric Opera's production of Richard Strauss's Ariadne auf Naxos (which you still have a little time to catch) turned out to be one of the best operatic productions of the season. But I was surprised (a bit) as to the reason why. I had expected this version (imported from the Welsh National Opera) to be remarkable in its witty physical comedy, after visits to rehearsals and chats with its director; instead - and probably most opera lovers will be glad to hear this - it was carried by some truly sublime singing. Boston Lyric is becoming known for assembling strong ensembles (rather than showcases for star turns), as evidenced by last year's Don Giovanni and this winter's Turn of the Screw. I'm happy to report that Ariadne auf Naxos belongs in that august company - indeed, it may boast the strongest cast of the three. The Strauss score features four notoriously difficult parts - the Composer (a pants role), Ariadne, Zerbinetta and Bacchus, and it's common for one or another of these (usually Bacchus) to prove second-class. But in Edyta Kulczak (Composer), Marjorie Owens (Ariadne), Rachele Gilmore (Zerbinetta) and Brandon Jovanovich (Bacchus), BLO put together a quartet of powerhouses. This production will be remembered most of all as a night of glorious singing. Indeed, if this Ariadne foundered slightly early on, it did so because of its stagecraft. Which is ironic, since the opera is so much about theatrical conventions and inside jokes. The famous set-up is that "the richest man in Vienna" has commissioned two works - a tragic opera (titled, of course, "Ariadne auf Naxos") and a baggy-pants comedy (performed by a visiting commedia troupe) - for the entertainment after a huge banquet. The trouble is that both pieces have to be finished by nine o'clock, when the fireworks are set to start. But the banquet drags, time runs short, and it's suddenly announced that the tragedy and the comedy will have to be performed simultaneously. You can guess what happens next. This opening "prologue" (as it's called) depends theatrically on a sense of growing chaos as time ticks remorselessly away - and the theatrical side of things is important, because much of this sequence is recitative rather than aria. But in this version, things seemed far too calm backstage, with hardly enough frenzied rushing hither and yon (often you see both the banquet and the fireworks roll by), and little sense of an impending artistic car-crash. Oddly enough, the bemused tone of the proceedings was just about right, and mezzo Edyta Kulczak gave an impassioned reading of the Composer's dismay at what was about to happen to his/her beloved score. But the success of this kind of thing is, as they say, all in the timing, and the actor-singers just weren't clicking like a well-oiled machine. There were a few timing problems in the pit as well, where Strauss's subtle, shifting sense of ensemble seemed to fray at times under the baton of conductor Erik Nielsen (horns, that means you). But Nielsen pulled his crew together once the "opera within an opera" began, and most of Ariadne's music (and particularly her transfiguring finale) sounded superb. Everything else about the production grew more original and intriguing, too. The tattered set (beset, despite its artificiality, by actual winds) was surprisingly evocative, and the sophisticated lighting, by Tim Mitchell, seemed to literally glow from the stage itself. As Ariadne, Marjorie Owens deployed a formidably Wagnerian soprano, but gave it haunting touches of mournful delicacy as she wept in her abandonment on her famous rock, and she nailed her diva-esque tantrums once the harlequins showed up, too. Her girl-group back-up (of Naiad, Dryad and Echo) likewise hit just the right tenderly droll notes. The commedia troupe proved not quite as rowdy as I might have liked, but this was forgotten once Rachele Gilmore launched into Zerbinetta's famous aria, a killer piece of coloratura in which the soprano explains that to get over one guy, you simply have to find another (as she has herself, over and over). It would be hard to think of a better Zerbinetta than Gilmore, with her ripe, lightly sensuous presence, and her deliciously pure and agile voice, and this set-piece almost couldn't have been more delightful. The finale of Ariadne auf Naxos. The big surprise of the evening, however, came with the arrival of Bacchus; from his opening bars, tenor Brandon Jovanovich let it be known that he had not only the range to hit the pitches (which climb into the stratosphere) but also the power to blow out the back wall, too, and his final duets with Owens felt like the promised series of (at least vocal) fireworks (Owens just won the Grand Finals of the Met auditions, and Jovanovich is off to the Met as well, along with Chicago and San Francisco, so this may be your last chance to hear these performers here in Mudville). Not that the final moments of Ariadne turned into a series of vocal guantlets; quite the contrary, in fact. If anything, the mood of the piece deepened just as it should, and with a little help from a truly inspired lighting effect from Tim Mitchell (which pulled together both those impending fireworks and Bacchus's invocation of the eternal stars), the final moments achieved something like transcendence. 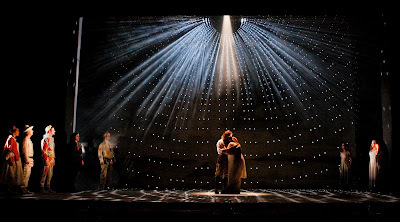 Out of a lifetime of theatre- and opera-going, this Ariadne's closing tableau will stick with me as one of the great stage images I've ever seen. If you catch the last performance, I'm sure you'll agree.